Hyundai Engineering and Construction Co., Ltd. KRX: 000720 (abbreviation: HDEC) is a major construction company in South Korea which has carried out projects not only in Korea but around the world. The company was founded by Chung Ju-yung in 1947 as the Hyundai Civil Works Company, and was a major component of the Hyundai Group. 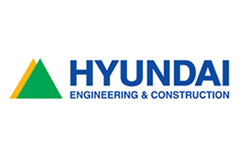 Hyundai Construction and Hyundai Engineering merged in 1999. Hyundai Construction played a major role in the importation of Korean labourers to the Middle East to work on construction projects there in the 1970s and 1980s; in the decade following 1975, when Hyundai signed their first contract in the region, for construction of a shipyard for the Iranian Navy near Bandar-e Abbas, 800,000 Koreans went to work in Saudi Arabia, and another 25,000 went to Iran; Hyundai was their largest employer.